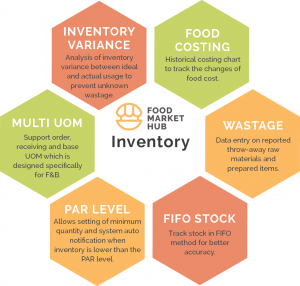 Food Market Hub Inventory Software is an cloud + mobile solution that helps F&B businesses such as Hotel, Restaurant, Cafe, Central Kitchen, Food Court and Kiosk to optimize their stock and simplify workflow management to maintain inventories in a cost-effective manner. Cost control – By control the wastage, F&B operator can reduce cost significant. Operation control – you can control purchasing, sales, picking list, receiving, production order, wastage, recipe all at single software. Recipe Card – You can put in all your processed item recipe and we will update it with latest purchase price, so you will know your COGS very well. Recipe Yield – Not just that, we support Yield to help you control your recipe wastage precisely. Barcode – We support barcode & FIFO at Food Market Hub to help you control the production batch better and track where all the production product deliver.